When taking samples, one of the more popular options in sampling equipment is the split spoon. Split spoon sampling for your Texas environmental drilling project is useful in sampling for lithological descriptions, geotechnical analysis that does not need undisturbed sampling, and for chemical analysis. What exactly is a split spoon? The split spoon sampler is a tube split into two equal halves lengthwise. The two halves are locked together during the sampling activities and released to retrieve the samples. At bottom end of the sampler sits a driving shoe. This is what cuts into the soil and provides the sample that goes up into the tube. At the other end of the tube is a coupling that allows it to connect to the drilling rod. Once a sample is taken, the operator removes the ends from the tube. This allows the tube to “split” open. Representative samples can be taken and put into containers for shipping to a lab for analysis, observed and field tested in the field, or discarded in a proper waste container if not warranted for the investigation. Where can split spoon sampling be used? One of the unique advantages of this kind of sampling equipment is that it can be used on most drilling rigs. The drilling rigs will drill down to a certain level and, at that point, the drilling team will install the split spoon and insert it down to the bottom of the hole. However if you are using hollow stem auger drilling methods you can simultaneously drive a split spoon while drilling. Using a drilling hammer, the split spoon gets driven down into the soil, and then pulled out. This kind of sampling works best in soft to compacted soils as long as there is not a large amount of rocks or cobbles. What is a core catcher and why use it? 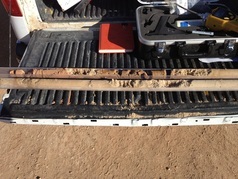 Some soils in Texas are silty or sandy and will not stay in the split spoon as it is drawn up. To prevent this from happening, a core catcher can be used. The catcher allows soil to enter the sampler, but prevents it from exiting. When the tube is withdrawn from the sampling hole, the soil will stay in place until the catcher is removed or the tube is split. Why use a sleeve in a split spoon sampler? When samples are being taken for chemical analysis, it is important to encase them in an inert material. To do this, a driller will insert stainless, carbon, brass, or acetate sleeves into the split spoon. Once the sample is taken, one of two things can happen. The entire sleeve gets capped and it goes to the lab for testing. Or the contents of the sleeve get emptied into an inert container for shipping to the lab. Who can do split spoon sampling? Get a professional drilling company to handle your split spoon sampling. They can do the job better and faster than trying to do it on your own. If you need sampling done in Texas, Oklahoma, or New Mexico, give us a call here at Talon/LPE. We have over 15 years experience taking thousands of samples. We have the technology, the teams, and the experience to get the job done right. Contact our Texas environmental drilling company today.